1. Cook the potatoes in boiling water for 10-15 minutes. Drain and cool. Meanwhile, place the haddock in a frying pan with the cream, cover and cook for 5 minutes. Allow to cool. 2. Mash the potatoes and stir in the flour, chives and sweetcorn. Remove the skin from the fish and break into flakes. Add to the mash and season. Mould into 8 fishcakes, then coat in the breadcrumbs. 3. Heat the oil in a frying pan and fry the fishcakes in two batches for 2-3 minutes on each side until golden. 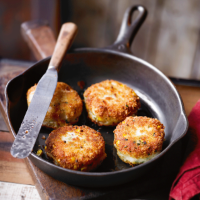 To freeze ahead, cool the pan-fried fishcakes completely, cover and freeze. To reheat, place the frozen fishcakes on a baking tray and cook in a preheated oven at 200°C, gas mark 6 for 25 minutes or until thoroughly cooked.